When taking on a kitchen remodel, considerations of form and function are critical. But, when it comes to the aesthetics, this is where your personality can really shine. This feisty gal, in the prime of her 80’s said, “I have spent all of my life decorating to please others . . . my friends, my family and even for resale. But this time, I want to decorate for ME!” She enlisted the help from the creative design team, Joann and Kelly of Kandrac and Kole Interior Designs to make her vision come true. 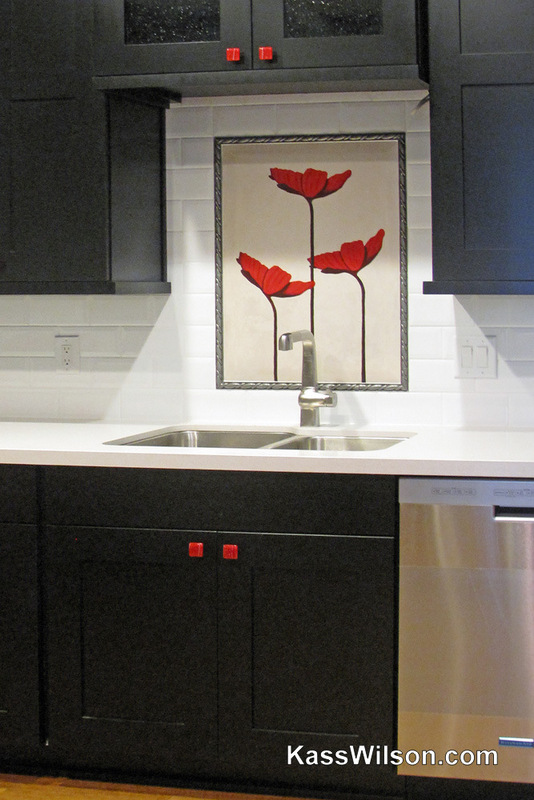 This client loved contemporary style, bright colors and unexpected artistic details. A palate of black, white and red was selected. 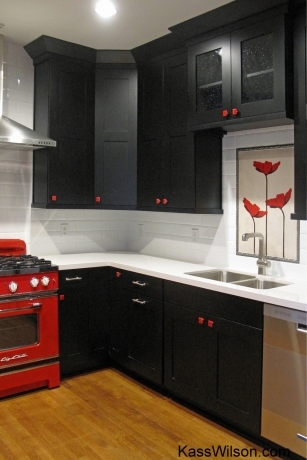 This is a bold color scheme that is timeless. The challenge was to give it a twist that would represent current trends and reflect her zest for life. 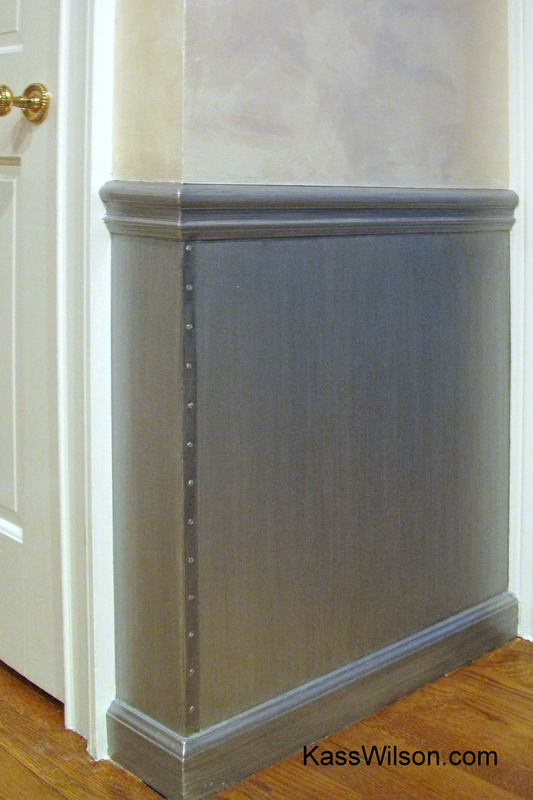 A reflective white faux finish was applied to the top half of the walls to soften the appearance and add a touch of elegance. 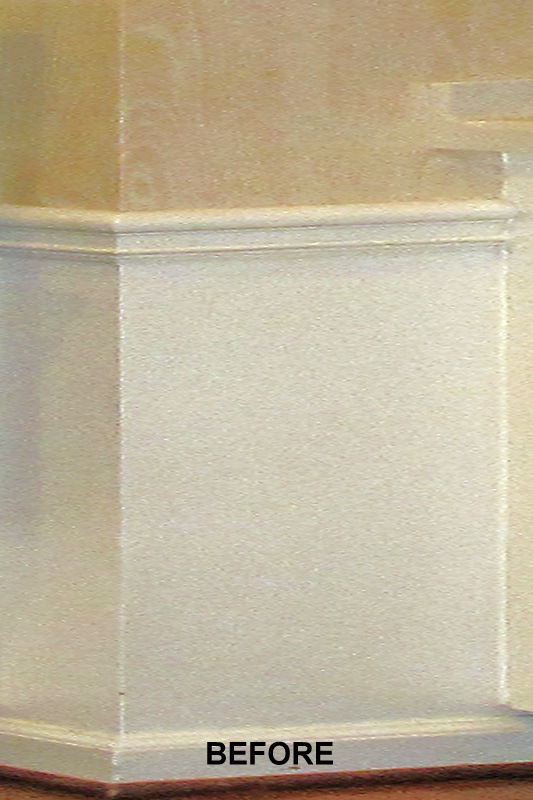 The faux technique on the chair rail below simulates sheets of stainless steel . . . complete with rivets. 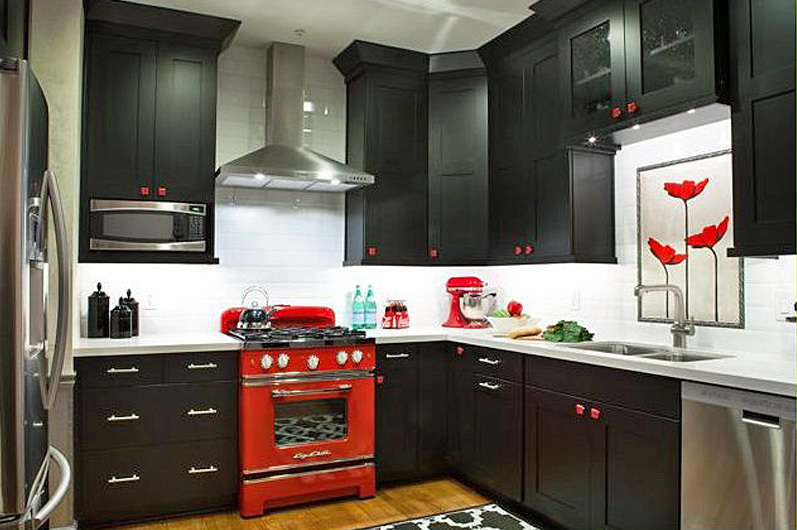 This compliments the new appliances and sleek vent hood adding a hint of an industrial feeling. 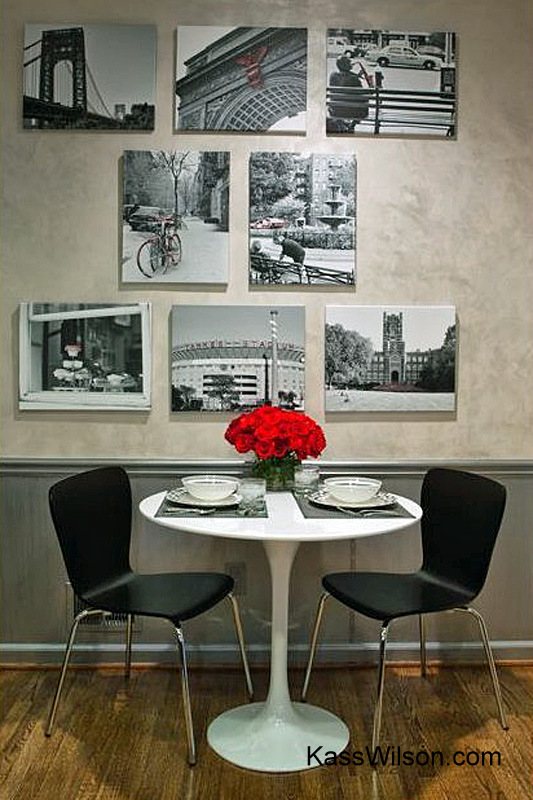 The vintage black and white photos on the wall are of New York City. That is where she grew up so they hold great meaning. Notice how each one was enhanced with small pops of red. 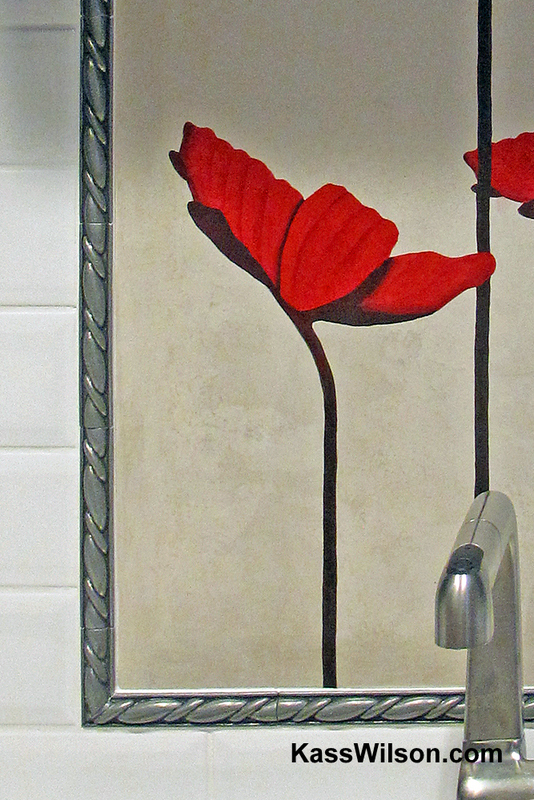 The back splash over the sink elevates the clever use of artistry to a new level. 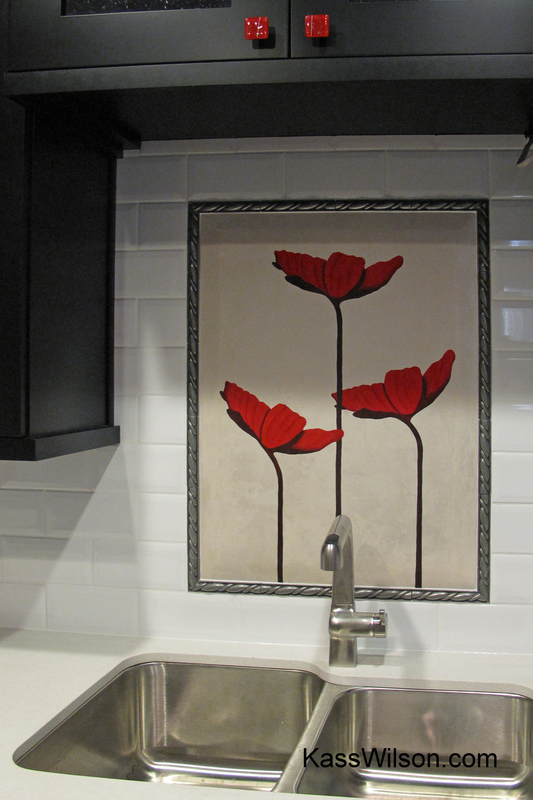 Joann and Kelly requested that I create a large hand painted tile of bold “happy” poppies. 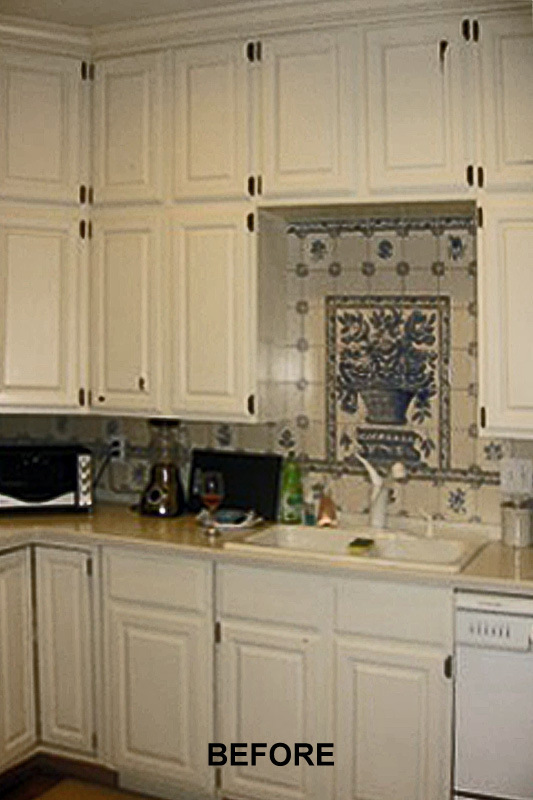 The background is a perfect match to the walls and fits perfectly inside the opening of the subway tile. Punctuated by the red art glass door knobs, this kitchen now incorporates unexpected details that make red, white and black totally unique. This classy lady was thrilled with each detail and told us, “Now, every morning when I walk into my kitchen it makes me smile. I feel 20 years younger!” What a great way to start the day . . . filled with energy and loving life! Thank you to Joann and Kelly of Kandrac and Kole Interior Designs. Your clever ideas keep me on my toes! Would this kitchen give you happy energy to start your day? We love it when you leave your comments below. Wonderful transformation bringing in those bold colors but adding that unique touch as well. Thank you for sharing. Remember our annual Kitchen & Bath issue is coming up. 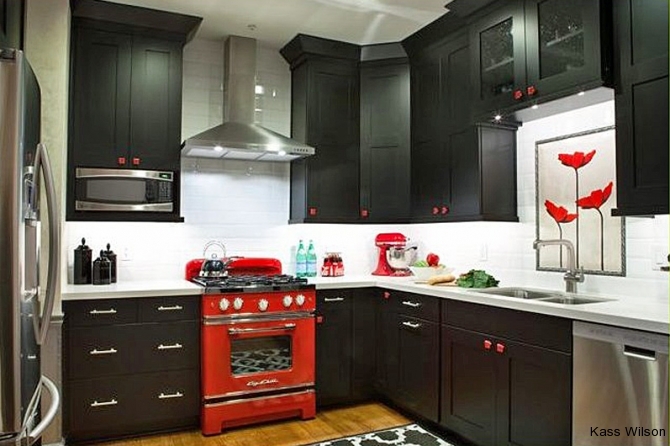 This kitchen is fabulous!I love the red accents.Great job Kass. Love this kitchen and really when you think about it, the spirit that is inside of us all is what shines and the greatest projects are the ones that speak to that spirit and are not watered down with what one might think pleases other people. Kudos to you and the design team Kass, it’s a wonderful transformation! Makes me smile too!! So bright and happy that optimism is the only feeling allowed here. Kass I love this owner for doing what she wanted and losing the fear I appreciate how you are always able to flesh out the vision to perfection What an artful space and reflects a big personality on the part of the owner! You must have had so much fun making her vision come true!